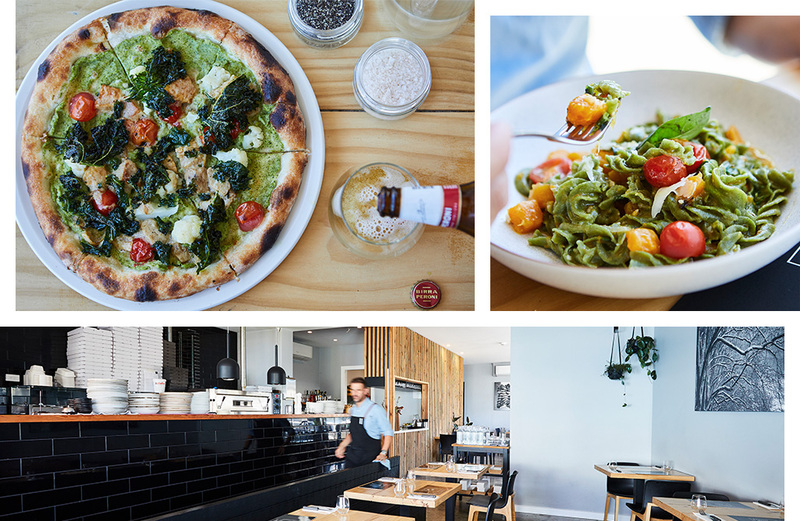 The words ‘vegan’ and ‘Italian’ are very rarely heard together, but that’s what you’ll find at Flour + Salt, a local Italian eatery in the laid-back suburb of Fairfield. Opening back in 2015, the restaurant darts out onto the corner of Station Street and Railway Place. The exterior is simple but distinctive—look out for the black brick and a simple sign that reads Drink + Pizze + Pasta. Inside the raw timber tables provide a full vista of the black tiled kitchen and pizzeria. The space is intimate yet comfortably spaced so there’ll be no elbow bumping, and throughout the warmer months, the outdoor tables give a European feel while you’re alfresco dining. Flour + Salt was opened to provide the area with a family style osteria (Italian for tavern). Founded by John Kanellakos and Mark Tobias, it has become a local staple for the good folk of Melbourne. Let’s talk vegan goodies, here’s a menu that is breaking the mould. Starters including the Sicilian chickpea and corn fritters with San Marzano tomato chutney or the red mizuna and black bean salad with blood orange instantly stand out. Move onto some spinach fusilli with roasted pumpkin, cherry tomatoes, and toasted pine nuts or go non-vegan and enjoy it with butter and brie, buona! Got them pizza cravings? The planet earth pizza is the vegetarian equivalent of the lot with tomato, sweet potato, roast capsicum, zucchini, herbs, fresh basil and topped with ‘notzarella’—a completely animal-free cheese substitute. There's plenty for carnivorous foodies, too. All pasta is made on site and the linguine ‘Al Nero’ is a fine example of this, the thin long strips nestled in the sugo of squid ink, chilli, local seafood, and garden herbs AKA a bowl of life healing goodness. Pairing with pizze is highly recommended here so that you can sample all the treats. We recommend the Pumpkin, with scamorza cheese roast butternut pumpkin, ricotta, and chilli grissini crumbs. It’s got the perfect combination of smooth and crunch. Dessert is equally decadent with a saffron panna cotta so fresh it’ll jiggle while you approach your next spoonful, sitting in a pool of raspberry granita and fresh berries it is the perfect ender for a summer Italian feast, make sure you wear your loosest pants or notch another hole in the belt loop. This one is worth it! Editor's note: This article is proudly sponsored by Flour + Salt and endorsed by The Urban List. Thank you for supporting the sponsors who make The Urban List possible. Click here for more information on our editorial policy.